CitePlag is the first plagiarism detection system to implement Citation-based Plagiarism Detection (CbPD) – a novel approach capable of detecting also heavily disguised plagiarism in academic texts . Existing plagiarism detection software only examines literal text similarity, and thus typically fails to detect disguised plagiarism forms, including paraphrases, translations, or idea plagiarism. CbPD addresses this shortcoming by additionally analyzing the citation placement in the full-text of documents to form a language-independent semantic “fingerprint” of document similarity . CbPD can be applied to any text containing citations – this includes academic documents, scientific publications, patents, legal cases, etc. The approach overcomes the shortcoming of existing text-based plagiarism detection methods. Existing methods typically fail to detect translated and strongly disguised plagiarism instances, since they only examine words (i.e. text overlap) in documents to detect suspicious similarity. Our observations confirmed that citation pattern similarity often remains detectable even if text has been translated or strongly paraphrased . Thus, in many instances, CbPD allows detecting plagiarism that could otherwise not have been automatically identified using the traditional text-based approaches: for example, when text was sufficiently disguised by synonyms or word rearrangement, or because copied text was translated. 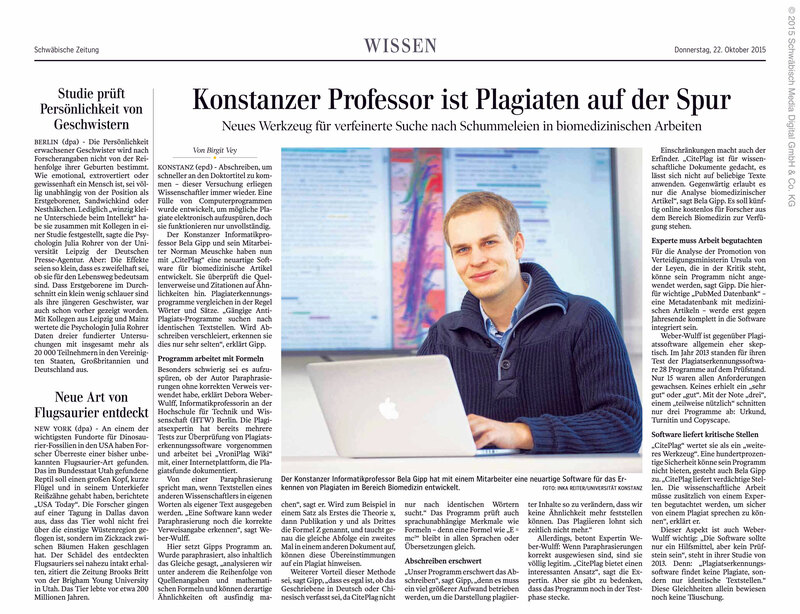 That citation patterns in plagiarized texts often have suspicious similarities with the citation patterns in the original source document(s) was also confirmed in our analysis of the plagiarized doctoral thesis of Karl-Theodor zu Guttenberg  as well an analysis of the VroniPlag Wiki performed in . An evaluation of the citation-based approach on a large scale collection of over 200,000 scientific publications in the PubMed Central Open Access Subset demonstrated the practicability of the approach in a real-world setting and on a range of realistically disguised plagiarism forms . For details and an in-depth analysis of the CbPD approach, refer to the doctoral dissertation of Bela Gipp, which is available as a book from Springer Vieweg Research  and for download here. CitePlag implements several citation-based algorithms to analyze the citation patterns of publications. The screenshot above shows two publications visualized in the CitePlag prototype. Matching citations are highlighted and connected in a central column for quick document examination. The documents share no literal text similarity: the left publication is in English and the right in Chinese. However, one can see that the overlap of citations is high, and the order in which sources are cited is nearly identical in several paragraphs. The English text only contains 7 citations that are not shared (gray circles) with the Chinese text. Journal of the American Society for Information Science and Technology (JASIST), vol. 65, iss. 2, pp. 1527-1540, 2014. Proc. Int. ACM SIGIR Conf. on Research and Development in Information Retrieval, 2013. Proc. ACM Symposium on Document Engineering (DocEng), 2011. Proc. ACM/IEEE Joint Conf. on Digital Libraries (JCDL), 2011. Proc. ACM Conf. on Hypertext and Hypermedia (HT), 2010. The national public radio broadcasters Deutschlandfunk and Deutschlandradio Kultur covered our collaborative research on Plagiarism Prevention and Detection and our prototype system CitePlag. Several media outlets recently covered our research on Plagiarism Prevention and Detection and our prototype system CitePlag. An article about our plagiarism detection system CitePlag appeared in uni'kon #59. Click on the picture to see the article in high resolution.